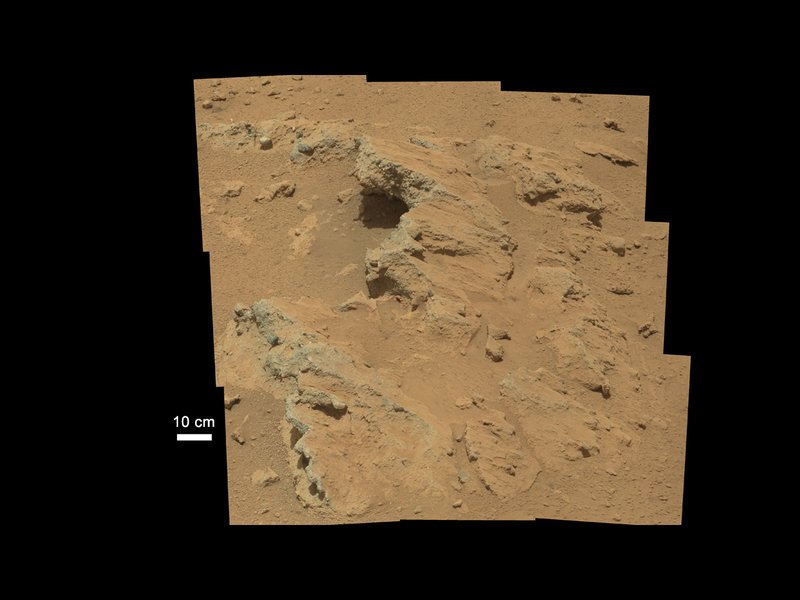 Today's Image of Mars was taken by MSL Curiosity; it shows further evidence that water once existed on Mars. What you see here are remnants of an ancient riverbed on Mars, including the prominent rock outcrop Hottah, named after Hottah Lake in Canada's Northwest Territories. This rock outcrop is a sedimentary conglomerate, meaning that it is comprised of small fragments cemented together. The outcrop is tilted up due to some sort of disruption, most likely as a result of nearby impacts and their associated tremors. We can tell that this used to be an ancient stream because of the size and rounded shape of the small rocks/gravel and the fact that small bits of the gravel and sand sized grains are cemented into the outcrop. Because some of the cemented gravel is round and too large to have been transported by the wind, scientists believe that it was transported by fast moving water, which is further evidence for this once having been a stream/river.